Just a quick round up of some links relating to various Scandalous Women. 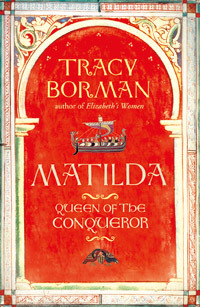 Historian Tracy Borman, whose new book Matilda: Queen of the Conqueror, was published by Jonathan Cape on 1 September, has a great podcast over at BBC History Magazine about Matilda. Borman is one of the History Chicks, along with Alison Weir, Kate Williams, and Sarah Gristwood, who lecture in the UK. How I long to be included in that group! At History Today, there is a great article about Louis XV's mistress Madame de Pompadour, entitled Madame de Pompadour: The Other Cheek, detailing some of the obscene and irreverent 18th-century drawings targetting the royal mistress. Thanks to Kathrynn Dennis of The History Hoydens for finding the article. I would love to read a historical fiction novel from the POV of Madame de Pompadour. Robert K. Massie, whose new biography of Catherine the Great, just came out this month has an interesting article over at The Wall Street Journal entitled: Catherine the Great's Lessons for Despots. Speaking of women in power, TIME magazine had a nice cover story on Secretary of State Hillary Clinton. Was Jane Austen murdered? That's what crime novelist Lindsay Ashford wants to know. Another fascinating article on the Bronte Sisters. Why has no one filmed a miniseries or a film about the sisters? I had heard rumors that Michelle Williams was involved in a project but there's nothing on Internet Movie Database. I, personally, think that James McAvoy would make an interesting Branwell Bronte, and I would definitely cast Cary Mulligan as either Charlotte or Anne. Given the interest in remaking Jane Eyre and Wuthering Heights ad nauseum, you would think a film about the sisters would be a slam dunk. I would love to see James McAvoy play Branwell Brontë. It's a pity we don't have a film. Denise Giardina's Emily's Ghost or Jude Morgan's A Taste of Sorrow (aka Charlotte and Emily) would both make good bonnet dramas.